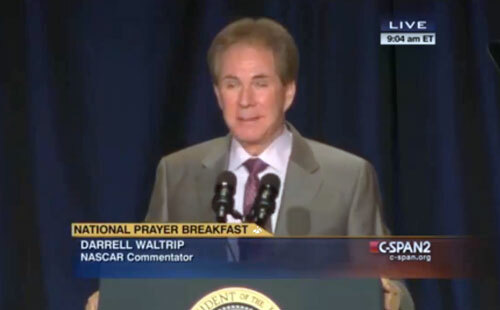 NASCAR legend Darrell Waltrip, delivering the keynote speech at the 2015 National Prayer Breakfast. LOS ANGELES, CA. — NASCAR Driver, Michael Waltrip, will compete on Season 19 Dancing With The Stars to air on ABC September 15. Michael is is a pro race car driver & co-owner of Michael Waltrip Racing. He is the younger brother of three-time NASCAR champ Darrell Waltrip. Michael will be paired with pro dancer Emma Slater. Photo shows NASCAR driver, Michael Waltrip, with dance partner, Emma Slater, speaking with New Yorkers in Times Square about Season 19 of Dancing With The Stars. 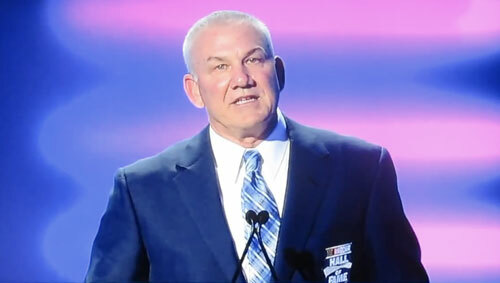 DESTIN, FL — Former NASCAR champion, Dale Jarrett, will be the featured speaker at the Southeastern Vending Association (SEVA) 2014 Convention on August 5-7 in Destin, Fla. The event, hosted by SEVA with support by NAMA, will be held once again at the Sandestin Resort and will feature a robust lineup of education, networking, social and family events, including dinner with special guest, Dale Jarrett. Source: Vending Market Watch. Photo shows Dale Jarrett speaking on July 29, 2014 at his Hall of Fame Induction Ceremony.